For the first time ever Legacy Family Tree is having a Black Friday sale! There are big discounts but the sale will only last one day. Are you working on a joint genealogy project with a family member or a group of descendants? You'll be able to share information easier if you are all working in the same software program that is the same version. 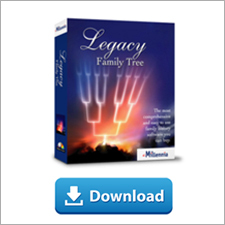 If you've hesitated to buy Legacy Family Tree software in the past, don't wait. Now is the time to buy. You won't see savings like this for another year. Buy it for yourself, a family member or a friend. Check our special Black Friday website page for all the discounts and details. For most Americans, Thanksgiving turns into a multi-generational gathering of friends, family or loved ones. While it might not be appropriate to do on-line genealogy research or to sequester yourself away to make a family history video, it is a perfect time to tell stories, record family history interviews or to encourage relatives to work together on future family history projects. When spending time today with your loved ones, enjoy the stories and memories of times past. Perhaps help some children record an interview with their grandparents. Stories recorded today can be used in videos created during a February snow storm when you are stuck at home. Or spend some time charming the teenagers in your family by convincing them that their technical expertise with computers and camcorders is essential for your next family history project. Our next Webinar Wednesday speaker, Devin Ashby, will be speaking on the topic "Family History for Kids." Spend some time this Thanksgiving enjoying a family history video Devin created with his family (and a few neighbors too). And don't forget to sign up for the webinar! He'll have more ideas like this to share with your during his webinar. Legacy QuickGuidesTM have quickly become one of the more popular resources for genealogists. Each guide contains four (sometimes five, sometimes more) pages of valuable information covering a variety of genealogy research topics, dozens of clickable links, and are written by genealogists and family historians who are experts in the subject areas. We've added two brand new Legacy QuickGuides: Organizing and Digitizing Family Photos and Preparing for a Successful Repository Research Trip, both by Deena Coutant. Now choose from 96 Legacy QuickGuides! Thanks to guest-blogger Lisa Alzo for this great article! 3. Saving Memories Forever (iPhone/iPad; Android. Free, and premium versions). Many writers turn to writing prompts to help jumpstart a story. The Saving Memories Forever App works like a series of writing prompts–only with audio. Start by creating a free account and adding yourself as a storyteller. Use the prompts (Childhood, Teenage Years, Adult, etc.) to record your story in your voice, and then start writing from your answers. There is a new feature called the audio diary (perfect for memoirs). You can record stories with a free account, but if you want to attach pictures and text files you’ll need to go premium. Is it important to you to get your kids or grandkids interested in family history? As family historians we spend a lot of time researching our family history. It would be nice if the next generations were as interested in family history as we are. Not only do we want them to share our passion for family history but it would be re-assuring to know that they will protect and carry on the research down through the generations. On Wednesday, December 3, 2014 Devin Ashby will present a webinar called "Family History for Kids" (register here). He'll have some ideas on how you can get the youngsters in your family excited about genealogy. "Kaitlyn (my now married 21 year old) goes with me to cemeteries and has since she was about eight. She always checks behind me to make sure I don’t make a mistake when I am transcribing markers. She is great with microfilm too. She can whirl through a reel without ever missing a name. She is the only one of my five children that is interested in genealogy." "I have three boys spread across six years. The age spread means that they are interested in different things at different times. As young children, they spent quite a lot of time with me in cemeteries and historic houses. With two teenagers it's harder to drag them along with me. Now I search for age-specific activities to get them involved. Activities involving computers, cameras and camcorders are always a hit. My old standby, of course, is inserting family stories into any conversation we are having." "Having met my wife in a Family History Center, I had visions of doing genealogy together throughout our lives. Turned out, she was just there for a part-time job to put herself through school. But I have four more chances to get a living relative interested in genealogy - my four descendants! Somehow, my 5-year-old daughter loves doing FamilySearch Indexing with me. Last night she said, "Daddy, can I index with you?" Together we indexed 2 names in a Zimbabwe death notice. At the end, I told her, "you just helped someone find their ancestor!" She smiled, and seemed to understand what that meant. Somehow my 9-year-old has also taken to Indexing. He loves indexing obituaries. They are typed and therefore easy-to-read. He also likes finding obituaries where people died on the same day as his birthday. It creates a small connection between them and him. My genealogy highlight with him was the day he stood in front of a group of 400 and taught them how to index. I tricked my 12-year-old into visiting a cemetery with me. My kids know that "you never know what happens when you go somewhere with Dad." I'll take them to ice cream, or to a movie, but this time I took Nathan to a cemetery where we took pictures with the BillionGraves app. I think what he liked most was getting to use Dad's phone (usually off-limits). My now-14-year-old, Evan, got his start in the Family History Library with me. We were on the way home from a family reunion, and I just needed to stop in Salt Lake City for a quick death certificate. I couldn't believe what I heard when he said, "Dad, can I come with?" I published the rest of the story here. There are lots of ways to get your kids involved in family history and each family is different. What are some of the ideas you've used with your own family? Legacy Family Tree is pleased to announce the addition of Marian Pierre-Louis, to our Legacy team. Marian will act as the Social Media Marketing Manager and provide outreach to Legacy customers through the Legacy blog, Facebook, Google+ and Twitter. Marian will also guest-host our new evening webinars in 2015. Marian is well-known in the genealogical community as a house historian and professional genealogist who focuses on New England research. 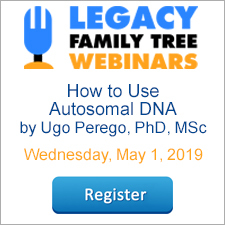 She has also been a popular presenter on the Legacy Family Tree Webinar series. Marian specializes in probate, deeds, New England town records and brick wall research. Marian is Program Co-Chairperson for the 2015 New England Regional Genealogical Conference (NERGC) and is actively involved with the New England chapter of the Association of Professional Genealogists. She is also a Director of the Federation of Genealogical Societies. In addition, she is the host of Fieldstone Common, an internet radio show dedicated to northeastern history and genealogy and The Genealogy Professional podcast, a show for anyone interested in a career in genealogy. Legacy's Geoff Rasmussen said, "We are excited to add Marian and her unique set of skills to our Legacy Family Tree team. She has a genuine enthusiasm for genealogists and genealogy research that will resonate well with our software users and webinar audience." We, and our Legacy customers are lucky to have her on our team. Marian brings 15 years of corporate marketing experience in the engineering and semiconductor industries as well as 8 years' experience promoting a small business. In addition to social media her areas of expertise include running targeted marketing campaigns, copywriting, website design and maintenance, and audio and video production. To celebrate her arrival, we've gone to the webinar membership vaults and unlocked one of Marian's popular webinars, Ten Brick Wall Tips for Intermediate Researchers. Normally available only for annual or monthly webinar subscribers, this webinar is free to the public until Thursday, November 27, 2014. Click here to watch. Ah, the highs and lows of family and genealogy. "How long have mom and dad been married?" Wondering why she was asking, but feeling confident because I knew I could find the answer immediately, I opened Legacy. Legacy's "Ages" tool will tell me exactly how long - to the day - they've been married. I quickly navigated to my parents, and then clicked on View > Ages. What I saw made my heart sink. Legacy has the tools to help me be a good son. I just wish I had used them before calling my mother the first time today. Fortunately, she loves me unconditionally. But if any of you have any advice for me, I could surely use some this morning. This week's Webinar Wednesday features Lisa Louise Cooke presenting "Using Evernote for Genealogy." Have you wondered what Evernote is or why you should use it? In this 2 minute video Lisa explains why it's a tool you should use for your genealogy research. After watching the video sign up for the webinar! Legacy user, Khadija, wrote in asking for some tips on how to use Legacy to make their family reunion even more special for everyone. 1. Have a large family tree for all to see and a small one A4 to give to each family member. For the large family tree I would do a Descendant Chart starting with your grandparents. All of your cousins will get a kick out of seeing how they fit into the family compared to everyone else. Legacy Charting has many options to customize the chart so you can make it really nice. Once you have it just like you want, you can order your custom chart through using our chart printing service available on the Publish tab. I have ordered charts this way and have been very pleased. You could just make A4 copies of this chart to pass out to the attendees but if you have the time it would be more fun to personalize the chart to each guest. Instead of creating a descendant chart, create individual four-generation Ancestor Charts with each person as the anchor of their own chart. They will go home with a nice keepsake and hopefully a new-found interest in their family history. 2. A slide show with family pics, with a bit of family history of my grand parents, aunts and uncles. There are two ways to do this. You can put together a slide show in Legacy using the Picture Scrapbook. You have complete control over which image files are used. Your family will be able to see the caption, date and any notes you have written about each picture. You can set the slide show to advance automatically and you can control the amount of delay between photos. This feature is very easy to work with. This is a great option if you can hook your computer up to a projector and show it on a screen so that everyone can see it. You can also use the free add-on program Passage Express. Once you download it you can access the program from within Legacy. This program will create a CD (or DVD, or others) with a multimedia presentation on it. You can add text narrative as well as sound narrations to the photos. CDs are cheap and this would be a great surprise to pass out at the reunion. There is also a Deluxe edition of Passage Express available if you are interested in some more advanced options. Legacy’s Publishing Center will help you create a family history book. You have complete control over the contents and there are plenty of options so that you can personalize it just like you want. One thing I really like is being able to preview the book as you make changes until you get it just like you want. You can pull any of Legacy’s reports into the book, each report being its own chapter. You can edit each chapter and you also have options that will apply to the entire book as a whole. Legacy has options to include a Title Page, Copyright Notice Page, Dedication Page, Preface Page, Index and more. As with everything in Legacy, you can customize the book to make it your own. You can save the book as a pdf file and most publishing outlets can publish from a pdf file. There are many print on demand companies on the internet such as Lulu and Blurb. You could also just simply put the pdf file on a CD and pass them out at the reunion. You can create a gedcom file and upload it to a website such as WikiTree. If you have your own web space, Legacy will create the webpages for you and then you can upload them. There are five different styles of web pages you can create and you have complete control over what is and what isn’t included. Rootsweb offers free web space to genealogists. 5. How can I save the whole family tree on a cloud, my laptop was stolen once, and I lost a lot of info because of that. I do not want that to happen again. Backing up your family file to cloud storage is a great idea. There are several free cloud storage servers available such as DropBox, OneDrive and GoogleDrive. I back up my files to OneDrive. I keep my ten most current backups and then delete anything older than that. If my computer crashes my backups will be safe. It is important to make regular backups and not wait too long in-between them. Since I work in my file every day I backup my file every day. There is an option to have Legacy remind you to backup your file if you are worried you might forget. Once you tell Legacy where you want to back up your file it will remember it and will continue to back up there until you tell it otherwise. There are more things that Khadija can do to make the reunion a one-of-a-kind event. How about printing name tags for everyone. You can do that right in Legacy. How fun is this! Legacy has a customizable Family Questionnaire you can pass out. If you have older attendees this might be your only opportunity to capture this information. Since you will be collecting information on persons still living make sure you have their permission to add the information to your file. Legacy is much more than a just a genealogy database program. Thanks to Legacy Support rep, Michele, for this article! She also writes the Ancestoring blog.